Welcome to the Puritan’s Pride Gift Card Giveaway! 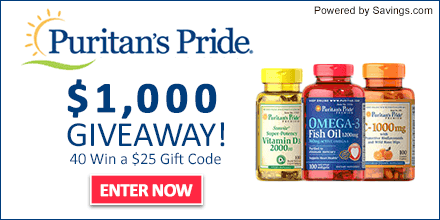 Do you want to win gift codes to Puritan’s Pride? You can buy some high quality vitamins and nutritional supplements with the gift card! Giveaway starts from Tuesday, September 29th at 12:00 AM ET to Monday, October 5th at 11:59 PM ET. Open to US residents, 18+ years of age. The winners will be chosen via a lottery drawing and notified on Tuesday (10/6) via the email address they used to enter.